Nice hotel. Great staff all around. Good choice of restaurants on premises. Everyone was pleasant. Only complaint, breakfast food in hot dishes were constantly cold. Love Loved the hotel! this place is huge! everyone was so nice and thoughtful! I will definitely stay there again! Stayed on the executive level for 4 nights. Wonderful service, great room, fantastic views and cuisine. The executive lounge has great food and service as well. My experience was great staying at the Marriott! They were very accommodating to my request. Great experience especially the steak house in 67th floor. Amazing view. My family and I had the opportunity to upgrade our room to an suite. This was a great opportunity to experience an 5 star treatment throughout our stay. Much better than The Fairmont on the Palm Jumeirah, which is a money grubbing piece of trash hotel that treats its customers like cattle to milk for cash. It's a great experience to stay in JW Marriott Marquis Hotel Dubai. During the afternoons the elevators banks were packed and there was no explanation or help. I waited for 22 minutes to get an elevator hen it stopped everywhere. There were limited people to help provide instruction or reasons during my stay. The cleanliness was good but I would come back at 2 and the room wasn't serviced. I had to call each day. Excellent hotel, modern, clean, comfortable with 14 restaurants and amazing 72 rooftop bar. Staff impressed us with readiness to please - at the pool, reception, housekeeping, in the restaurants, at breakfast 37th Floor Business Lounge and everywhere. I wanted to thank them all. Guest Relations Supervisor made us feel even more special. I am looking forward to get back to this hotel. It is modern, luxurious but warm. Bathroom is amazing and huge. Gym and La Farine work around the clock. Elevators are fast and not crowded although the hotel was full. I believe we got the value for the money too. Glad I am a Marriott Elite Member. I want to personally thank Amr, Oni, Keshav, and others on 37th Floor specially for their hospitality at the Business Lounge. Also I remember Frederic from the pool, Pia and Maxon at the reception and everyone who were very nice and I am looking forward to come back to this hotel. We enjoyed it so much! It was a good and perfect location to do business in Dubai. They had a good service. Thank You JW Marriott Marquis for the generous welcoming of us. I stayed there with family and friends for a week and it basically was fabulous!! I highly recommend it!! Just perfect. Ultra luxury place. nicely located in the middle of new Dubai, close to Mall of Dubai but not far from Mall of the Emirates. My room was in the 59th floor and the view is magnificent. Car Valet is for free all the time. Great luxury lobby with many meeting tables that you can actually use to conduct meetings without any need to book a meeting room, if you don't mind people passing by your meeting. The price I paid was in total less than $250/night, which is very cheap in Dubai, but that was due to the fact that it was the holy month of Ramadan, so we (Saudis) tend not to travel a lot during this month , and Saudis make a sizable portion of tourism in Dubai. 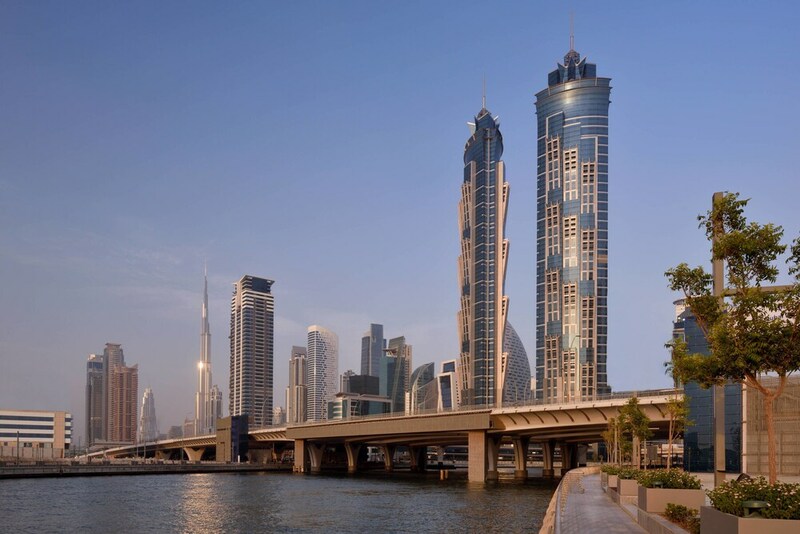 Located in Downtown Dubai, JW Marriott Marquis Hotel Dubai is within 2 miles (3 km) of popular attractions such as Burj Khalifa and Dubai Fountain. This 5-star hotel has 1608 rooms and welcomes guests with 14 restaurants, a full-service spa, and an outdoor pool. There are multiple options for onsite dining with 14 restaurants, including Kitchen6, which specializes in international cuisine. Satisfy your hunger from the comfort of your room with 24-hour room service. For your convenience, a full breakfast is available for a fee. Guests can expect to find 46-inch an LCD TV with satellite channels and a DVD player, along with free WiFi and wired Internet. Beds sport pillow menus and down comforters, and the bathroom offers a soaking tub, a rainfall showerhead, a hair dryer, and designer toiletries. Other standard amenities include a minibar, free newspapers, and free bottled water. At JW Marriott Marquis Hotel Dubai, guests enjoy a full-service spa, an outdoor pool, and a children's pool. You can take advantage of free valet parking, along with an airport shuttle (available 24 hours) for AED 200 per vehicle one-way. Front-desk staff can answer questions 24/7, and assist with dry cleaning/laundry, luggage storage, and concierge services. Other amenities at this luxury hotel include a health club, a steam room, and free WiFi in public areas. nice hotel close to dubai mall. Kitchen6 - Restaurant and bar specializing in international cuisine and serving breakfast, lunch, and dinner. Prime68 Steakhouse - Steakhouse and bar specializing in American cuisine and serving lunch and dinner. Reservations required. La Farine - Restaurant and bar specializing in French cuisine and serving breakfast, lunch, and dinner. Rang Mahal by Atul Kochha - Ocean-view restaurant specializing in Indian cuisine and serving dinner. Tong Thai - Restaurant specializing in Thai cuisine and serving dinner. The hotel has an outdoor pool and a children's pool. A health club and a steam room are other recreation options. The front desk is open 24 hours a day. For convenient arrivals and departures, you can take advantage of the airport shuttle (available 24 hours), which is offered for a fee. Driving? This property offers free valet parking. Guests must contact this property in advance to reserve a rollaway bed (subject to availability.) Contact the office using the information on the reservation confirmation received after booking.